Japanese Episode AG 081: "Kagebouzu no Yakata!" American Episode 353: "Take This House and Shuppet"
Satoshi and his friends are traveling to their next destination when it begins to rain. The group frantically looks for shelter and become lucky when they come across a large mansion. However, as soon as the gang goes through the entrance, the front door shuts and locks itself! Trapped inside, Haruka begins to blame Masato for their predicament. An argument starts that ends with Masato running away. Satoshi-tachi begin their search for their young friend while Haruka stubbornly refuses to apologize. Along the way, Masato manages to meet the ghost pokemon, Kagebouzu, and it is revealed that the pokemon more or less owns the mansion they're trapped in. 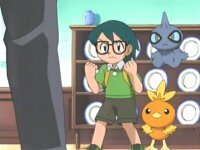 Masato decides to use the pokemon to get back at his sister by having it use its Psychic abilities to scare Haruka and the gang. After a while, the Rocket-Dan, who are also trapped in the mansion, come for Haruka's Achamo, so Masato steps up to stop them. Haruka sees this gesture and apologizes to Masato as the two siblings send the Rocket-Dan blasting off again. Masato says goodbye to his new pokemon friend as our heroes leave the mansion to continue their journey. Eh, I liked this episode better when it was called "The Tower of Terror." The afro thing was funny, but everything else about this episode told me that the writers really are running out of ideas. The dubbed version is more or less as I expected it to be. Emily (a completely useless excuse for a character, by the way) had a voice that grated on me, but luckily she only had a few lines in this episode. Otherwise, it was the same old same old. Four seconds are cut from that first shot of space at the beginning of the episode. When the Rocket trio are arguing outside, a shot of Musashi punching both Kojirou and Nyasu in the face is cut. 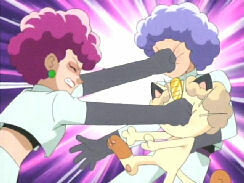 In the dub, we see those impact stars that the anime loves to use, and then the scene after the punch with James and Meowth having these big punch marks on their faces, but the actual punch itself is cut. When Masato is exploring with Kagebouzu (this is right before he sees the playground), the final ending theme to the original series, Pokettaari Monsutaari, plays in the background. It's replaced by regular background music in the dub. I actually don't mind the change this time because a) I'm not a huge fan of Pokettaari Monsutaari, and b) the song was awkwardly placed in the Japanese version anyway. Another vocal song? In the same episode? When Haruka enters the room where Masato tries to protect Achamo from the Rocket-Dan, the second Advanced Generation opening theme, The Challenger! !, begins to play and keeps playing until the cabinet starts to fall toward Masato. It's replaced by background music in the dub. A second is cut right after Kids' WB! 's final commercial break. Three seconds are cut from the TO BE CONTINUED... screen.